West Germany, Museum Folkwang Essen and London, Whitechapel Art Gallery, Anselm Kiefer, October 1981-May 1982, p. 38 (illustrated). Los Angeles, University of California Art Museum, New Figuration: Contemporary Art from Germany, January- February 1983. Anselm Kiefer's Dein Blondes Haar, Margarete from 1981 is a poignant reference to the Romanian poet Paul Celan and his tragic poem "Death Fugue." The poem, set in a Holocaust concentration camp, alludes to two notional female figures: Shulamite, a Jewish prisoner of camp with ashen black hair, and Margarete, a free Aryan woman with golden blonde hair to whom the camp commander writes love-letters. With its title, which translates to Your Blonde Hair, Margarethe, this painting conspicuously centers on the latter. 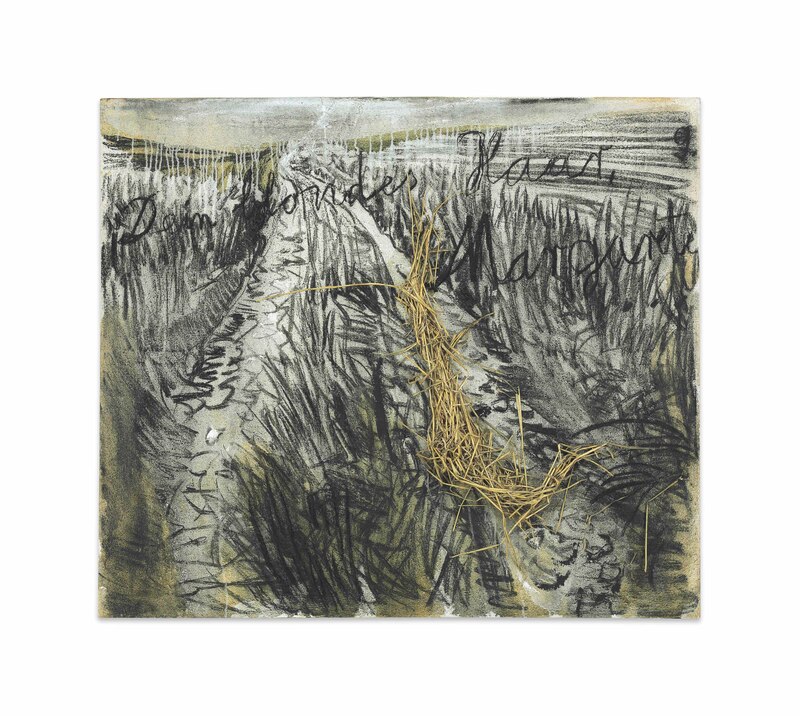 She is symbolized by a cascade of yellow straw that Kiefer has embedded into the surface of the painting, whose otherwise grayscale background is a depiction of wheat fields recessing into the distance. The straw both physically and visually emerges from the painting's surface, a badge of vitality, strength and survival in an otherwise dismal environment. Having been influenced by Joseph Beuys and Italian Arte Povera artists, all of whom employed unlikely materials to reveal the ravages of time, Kiefer very purposefully selects the materials he uses in his own oeuvre, each one bearing a specific association for him. Represented by straw-organic and consequently with the potential to burn-Margarete symbolizes the German love of land and that land's complicated history of destruction and rebirth. "I like strawIt is a material from the earth which is also golden and gives off energy, heat and warmth when it is transformed through burning, leaving the earth clean again and ready to begin anew" (A. Kiefer quoted in A. Albano, "Reflections on Painting, Alchemy, Nazism: Visiting with Anselm Kiefer," Journal of the American Institute for Conservation, vol. 37, no. 3, pp. 352-353). In addressing Germany's anguished past, there is perhaps no other artist to have navigated the difficult terrain between remembrance and transcendence quite like Kiefer. He frequently alludes to religion, mythology, literature and other artists in his art, building upon an accomplished lineage of historical figures. Dein Blondes Haar, Margarete is not only an attempt to memorialize those lost to the Holocaust, but also to immortalize Celan himself. As the only member of his family to survive incarceration in a Nazi concentration camp, Celan embraced poetry as an attempt to come to terms with the traumatic experience. The psychological stress was ultimately too great; in 1970, he drowned himself in the Seine River in Paris, tragically joining the countless Holocaust victims he sought to venerate in his poetry.